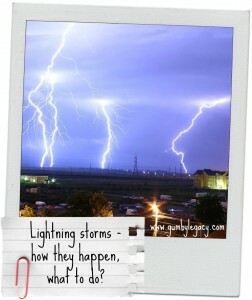 You are here: Home / Loving Nature / Lightning storms – how do they happen, what to do? 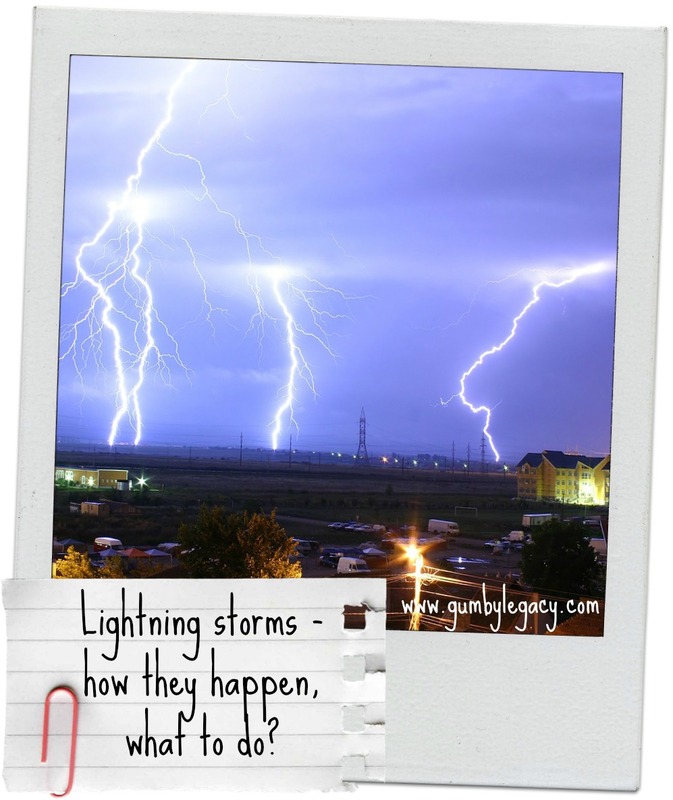 Lightning storms – how do they happen, what to do? Well, the last 24 hours we’ve had quite a few storms! With thunder and lightning that even tripped our electricity a few times (although to be fair this doesn’t take much of an outside disturbance). 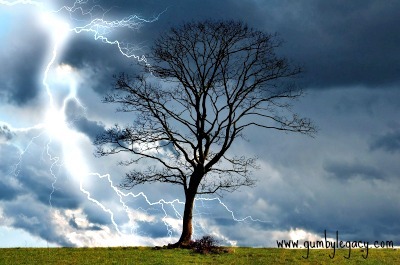 Anyway, due to this fairly rare but always memory-provoking and enjoyable occurrence, I thought I’d find out a few interesting facts about thunder and lightning for you today. Back in SA (and I believe in America as well? ), storms happen almost daily in the hot summer weather. Days are sweltering with a brief but often welcome, heavy rain shower in the late afternoon, cooling the air down a bit until the evening. The open porch in our parents’ house in Muldersdrift was the best pace to be able to watch electrical storms from. I remember sitting there being terrified that it would strike the house and cause the thatched roof to go up in flames (I’ve always been a bit dramatic and paranoid around fire)! Thankfully, it never did and I believe we did have all the appropriate preventative measures in place so chances were very small that something would happen. The term thunder and electrical storm are used interchangeably and actually mean the same thing. All storms are electrical due to the way they come about and this is unbelievably complicated so I will do my best to explain it but if I fail and you are left wondering, here and here are two sites I found quite informative. Huge electrical charges are formed inside cumulonimbus clouds with negative charges gathering at the bottom, positive preferring to rise to the top. Why this happens is not fully known but this separation of charges produces a powerful electric field which stretches from the bottom of the cloud to the ground, causing the earth to become positively charged. Eventually, the electrical forces at work overcome the insulating, normal properties of air and this, along with less resistance and the quickest route down to earth, causes the cloud to discharge, producing a lightning strike. Although this strike looks like a single flash, it is actually made up of three to twelve individual lightning ‘strokes’, giving it a flickering appearance. The amount of energy surging towards the earth is so intense that it heats up the air around it to a temperature three times hotter than the surface of the sun. This heated air expands and explodes, creating a ‘shock’ wave of thunder. According to physics, sound travels much slower than light so even though both happen at exactly the same time, we see the lightning before we hear the thunder. If you want to try to work it out, sound travels roughly 1 mile every 4.5 seconds so if it’s less than 30 seconds away, it’s best to take cover. Near our home in Muldersdrift, there was a game farm where the ground was made mostly of a stone called dolomite. Apparently this is a natural lightning conductor as they sadly found out when their giraffe population was wiped out from lightning strikes. What to do if you’re caught in a storm? Find shelter immediately. A solid building like a house is best but remember that lightning will find the fastest route to the earth so could travel down electrical cables and water pipes. Switch off and unplug all large electrical appliances and don’t have a bath or shower! Also, don’t talk on a corded telephone however a mobile phone is ok.
Stop driving if you are safely able to do so. Close doors and windows but don’t touch anything that could act as a conductor such as doors, steering wheel or gear stick. If there are no buildings around, stay away from high or open ground, fields, trees, electricity pylons, telephone poles, mobile phone masts or anything else really tall that may attract lightning (like giraffes!). Stay away from all water. Don’t hang on to anything metallic like an umbrella, golf clubs or a fishing rod. Rather put these down and collect them after the storm has passed. If you are in a wood or forest, stand next to shorter trees rather than taller ones and if you have any idea what you’re looking at, it’s advised to avoid oak, elm, pine and ash trees as these are most frequently stuck. If you are camping, be a bit strategic when pitching your tent. A tent offers no protection at all from lightning so if you are able to, shelter in a building or vehicle. It used to be advised to crouch down with your head between your knees but not anymore as you are still at a high risk of getting struck. So, if you are planning to be out and about, keep an eye on the weather and have a plan to get to shelter if it does turn stormy. It is advised to wait for at least 30 minutes after you last hear thunder before venturing out. People are killed yearly because they are struck by lightning, thinking a storm is over when it is isn’t. Lastly, there was always the rumour that wearing rubber soled shoes would help to give some protection and insulation against being struck. Turns out, with the amount of energy produced with each lightning bolt, a quarter-inch rubber sole doesn’t stand a chance from a direct hit. Most people in South Africa know of somebody who knows someone at least who has been struck by lightning. Unfortunately, somebody we know of was actually sitting on a rock to watch the storm while the rest of his friends were standing. Somehow, the electrical current from the lightning travelled underground and struck him where he was sitting. Possibly, due to the fact that his friends had shoes on, they were ok? From what I can see, this incredible display of nature is as unpredictable as everything else. While lightning can be quite scary and is definitely able to cause some damage and harm, it is an extraordinarily awesome, beautifully natural phenomenon. We were always told as kids that it was Father Christmas getting toys ready and that they had all just fallen out of the cupboard. What stories were you told or do you use to explain thunder? Try this page for a handy live tool to see where strikes are happening anywhere at any time (scripts turned on required).